or order free copies here. Sustainable development is among the most important challenges of our time. Striving to lead an environmentally friendly way of life that conserves resources is essential to preserve our world for subsequent generations. With its top locations for innovation and research, Germany is aiming to reach this goal by intensifying international cooperation. Young minds in particular have the creativity required to spark the lively and successful partnerships of today and the future. 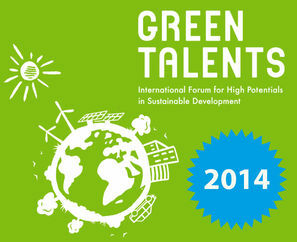 Join the Green Talents Competition and gain exclusive access to the hot-spots of sustainable development. An invitation to Germany in 2014 to participate in the fully funded two-week science forum. While touring Germany, top locations will open their doors to the Green Talents and offer them an exclusive insight into their facilities and projects. A second invitation to Germany in 2015 for a fully funded research stay of up to three months. At an inspiring location of their choice, the Green Talents will gain new experiences and advance their professional careers while establishing long-lasting partnerships. Exclusive access to the “Green Talents Network” of over 100 high potentials in sustainable development from over 35 countries. Deadline for submission has expired. The awardees have been selected and you can access detailed profiles of them here. You may also learn more about the Green Talents Science Forum 2014 on the following pages where we have published short reports on the visits to some of Germany's most outstanding research locations.